For more than eight decades, June Daisley Lockhart, ’38, has been making art and has no intention of slowing down. Much of her early training took place at Cranbrook while portions of the original campus were still being planned and constructed, at a time when some of the world’s greatest artists were making their own indelible mark. Her sculpture teacher at Kingswood was the legendary Marshall Fredericks, who would go on to create the iconic Spirit of Detroit sculpture in downtown Detroit. “He recognized my interest and determination and even arranged for me to go to the Art Academy and work in the sculpture classes there,” Lockhart says. Later, as a senior at Kingswood, Lockhart wrote her thesis on the work of Milles. “I showed it to him and he asked for a copy,” she says. “When I gave it to him, he gave me the maquette of Jonah and the Whale.” That model is now outside the Kingswood Library while her thesis resides in the Cranbrook Academy of Art library. Over the course of her career, she also has made time to help others find their artistic path. 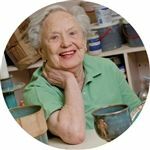 “I have been teaching others to do pottery and sculpture for at least 50 years,” Lockhart says. Her work and the exhibition inspired a gift to Shell Point to create an on-site art center in which she and other artists can work. “The ground breaking has taken place and I ought to be able to throw a pot there on my 100th birthday,” she says.